Hey everyone! It's Jenni Hufford here today and I am sharing a little bit of Project Life using JBS cut files and products! 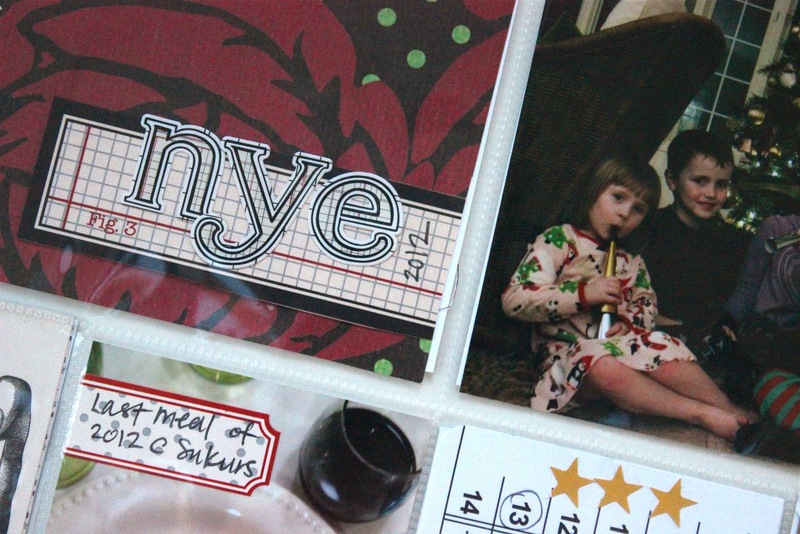 Today I am sharing my closing page for 2012. I am the first to admit-- closing pages STUMP me. I never quite know what to include. My Project Life week runs from Monday -- Sunday. Since December 31 fell on a Monday, I was just planning to include a photo in the prior week's spread. That's when I had the idea that New Years Eve should be my closing page--- what better way to conclude the year?? I used many pieces from the Red/Black Collection in my spread. It allowed me to have a Holiday theme without looking too Christmas-y. I especially loved the clocks in the Red and Black Collection/ Mini Pattern-- the clocks were perfect for my New Years Eve theme! The paper on the top left pocket is from the Family Tree Paper Pad. I took so many photos on New Years Eve that I decided to include an insert on my closing page--- yea, i know, who makes an insert on the closing page!??? But that's what I love about Project Life, you can make up the rules as you go. The JBS Cardstock Feathers were the perfect final touch. I adhered them on top of my page protector. I backed my insert simply with pattern paper and adhered the page protector (which is just a 12x12 page protector trimmed to fit my insert) with washi tape. This is just amazing Jenni!